In this fourth post in a series on mental ray for Maya 2016 Render Settings, we follow up on the Using Modern Materials and Lights post with more detail on the new Physical Area Light. Note the new mental ray section. All lights below the line are mental ray lights. The Physical Area Light is a Maya Area Light set up using the mila_light shader, for best operation with Layering (MILA) materials. The Physical Area Light has physically-based falloff (Light Decay is Quadratic) so the intensity of the light compared to the scene scale matters. It is the number one reason we find when troubleshooting a physically-based scene that renders black or dark. Take the following example. A default polygon plane is created on the default grid. The plane is scaled up to the size of the default grid. A Physical Area Light is created and moved to 4 units above the plane. Then rendered, noting that the default intensity of the light is 100. Now the light is moved to 10 units above the plane. Rendered. And barely lighting this plane, so more than that requires more light intensity. Also, the size of the area light matters. A flashlight can light up a baseball, but it cannot light up a baseball field. This kind of thinking has to start informing your lighting decisions. But once you get used to it, it may actually help you work more efficiently to produce realistic lighting results. With Light Importance Sampling (LIS) on, the area light Samples settings are ignored, and quality of direct lighting can be more easily controlled with the Lighting Quality setting in the Quality tab of the Render Settings. This is especially useful for scenes with many lights. 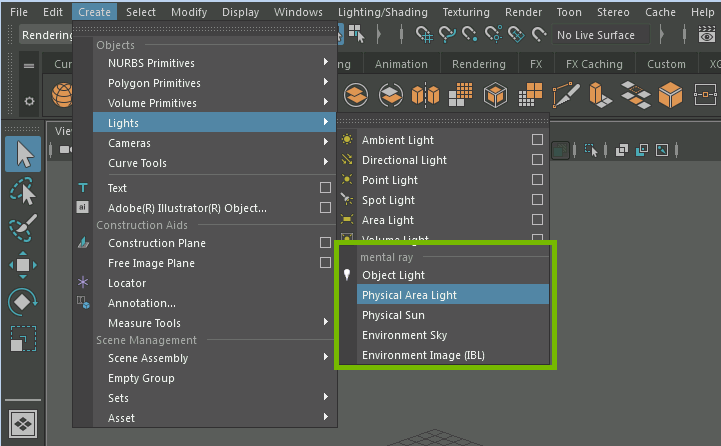 Because the Physical Area light automatically uses the texture-able mila_light shader, one can set the input for the light Color with a Maya File node. By the way, we also updated the physical_light to be able to use textures, but now the mila_light is preferred, as it will evolve with the physical area light. Example using an HDR textured rectangular area light. The intensity multiplier scales the values whether they are HDR or LDR. It’s just a multiply of whatever the texture returns. In other words, the texture is not normalized before multiplication. The physical area light defaults to use a point light output pattern over the surface area of the light. In order to use a more spot-like falloff for the edges of the area, we need to adjust the area light. To do this, change the light type of your Physical Area Light from Area Light to Spot Light. It is still a Physical Area Light because it uses the light shape. The mila_light shader remains hooked up to the color and the intensity. Great article. Are you still writing one about object lights?